“SUPERPOWERS really?” my first thought when OfficeMix was introduced to me. At that time, I didn’t think anything could make PowerPoint better as it already gives my lessons an edge so what can this new tool do for me. Being curious by nature I thought I’ll give it a try. The introduction to add-in just said, ‘Office Mix allows you to turn your PowerPoints into interactive online lessons or presentations’ but that surely is being modest about it. As I explored the superpowers of OfficeMix, I was able to generate many ideas of what I now do with my newly acquired superpowers. I’ve been trying out and thinking of authentic and effective ways to centre Student Voice within our inquiry planning to capture the entire process to reflect the growth of the student. This tool came in as a blessing as my students can begin using it at the very beginning stage and use it as their inquiry tool without having to leave it for most of the parts of the inquiry cycle. It therefore helped me capture and share their learning journey in the form of their portfolios that could be well used for reporting too. Tuning In (brainstorming, generate guiding questions): This is an introductory stage where this great add-in can help educators gauge student’s prior knowledge. For this the educator can share with students pre-designed questions to elicit and evaluate responses using Free Response Quiz or Multiple choice Quiz or True/false quiz app or to check prior knowledge or to brainstorm an idea to tune students into the inquiry/topic. The educator can also use Khan Academy to recall/ refresh/front-load students with previously taught content so that students are better prepared to inquire the topic. The educator can even choose to record a screen cast of oneself revising the lesson taught earlier to help students recall and refresh concepts and can save class time by sharing it with students as home task to revisit concept before beginning to inquire. Finding Out (resources, web evaluation): The inquiry is now this is a research stage where students can use the add-in apps like web viewer and CK-12 Science/Math Resources to get information and embed it in the presentation. 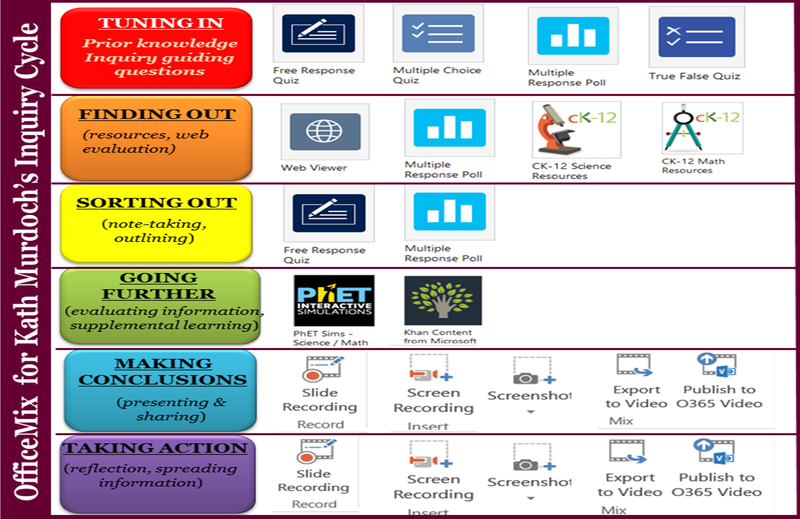 This would serve as a learning record and helped me as an educator to track their learning path. The students can use the Multiple Response Poll Apps to gain insights or analyse a particular element or idea. Sorting Out (note-taking, outlining): At this stage the students are trying to make sense of the collected data and also outlining the key points. The students could do so by recording their responses to the guiding questions provided to them using Free Response Quiz App. Even at this stage the students can use the Multiple Response Poll Apps to gain insights, confirm or analyse information/ element/ idea before arriving at a conclusion. Going Further (evaluating information against guiding questions, supplemental learning): The educator can at this stage provide content from Khan Content/ PhET Sims/ CK-12 Science/Math Resources from the add-in apps to students that can be used at this stage to clarify and confirm findings. Making Conclusions (presenting): The students can now present and share their findings with the rest of the class, they can use Screen Shot and/or Screen Recordings to plan and pre-prepare the way they would like to present data. This could also help foster communication skills and thereby helps them discover ways to convey their new learning in an interactive and interesting way. Taking Action (reflection, spreading information): The students are now ready to share and spread the word about their new understanding. They can once again use Screen Shot and/or Screen Recordings to record voice and maybe even incorporate Digital Ink before exporting it into a video to share it with others and let their voice be heard. This amazing tool gives me the power to cater to varied learning styles as well as provide a variety of learning engagements beyond my usual tool kit. OfficeMix along with PowerPoint makes the unit to be engaging, relevant, challenging and significant which are the main ingredients for learning to be successful!